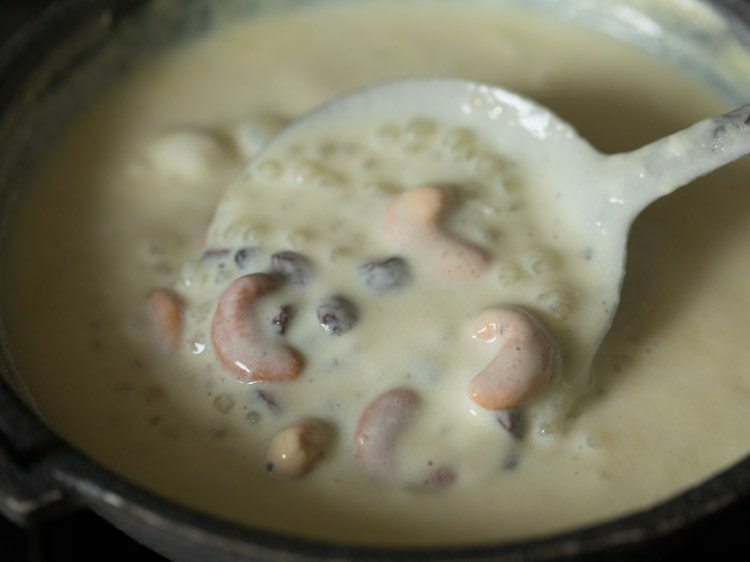 javvarisi payasam is a sweet creamy dessert made with sabudana (tapioca pearls), milk, ghee, sugar, raisins and cashews. 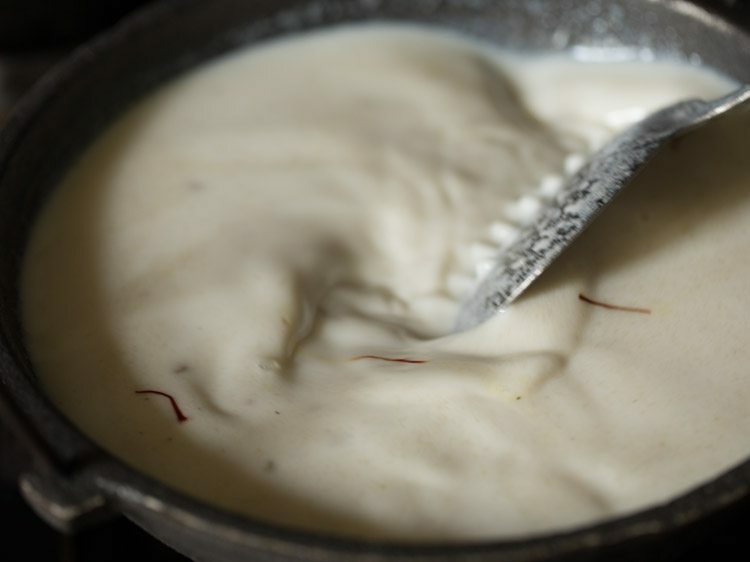 javvarisi payasam recipe with step by step pics. 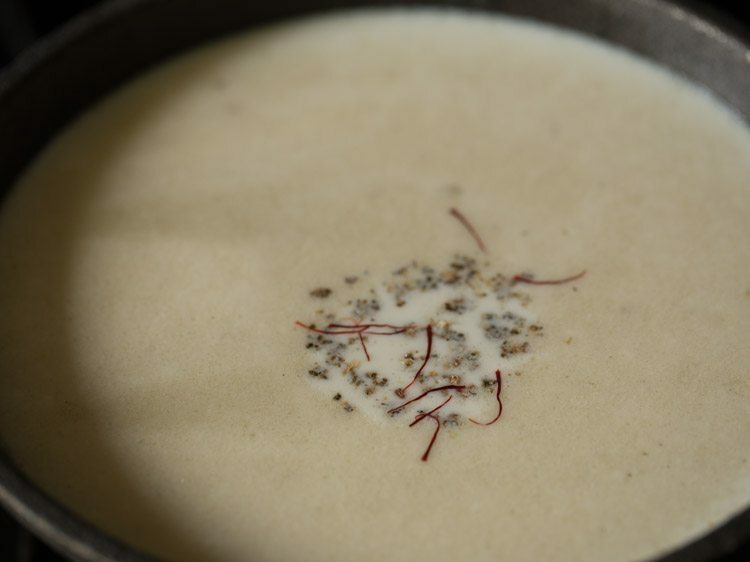 javvarisi payasam is the south indian version of sabudana kheer. 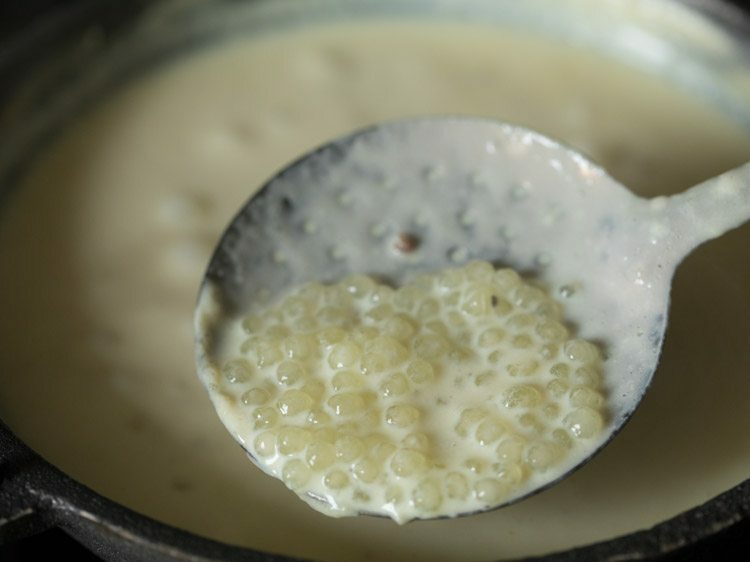 this sweet creamy delicious dessert is also called as saggubiyyam payasam or sago payasam. 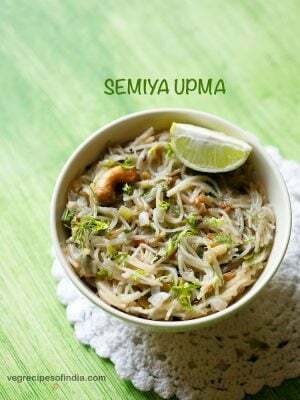 i make javvarisi payasam similar to the way i prepare poha payasam with a few differences. 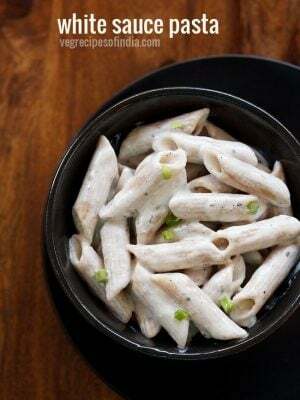 in this recipe you don’t need to soak sabudana, but do note that cooking sabudana without soaking takes more time than if they were soaked and cooked later. 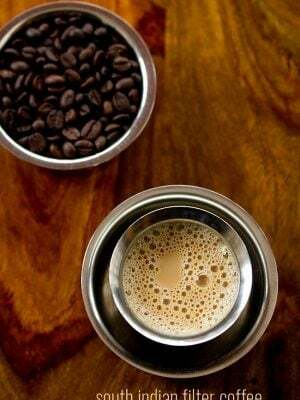 this method best comes handy and is useful when you want to make sabudana payasam any time or have forgotten to soak the sabudana before. 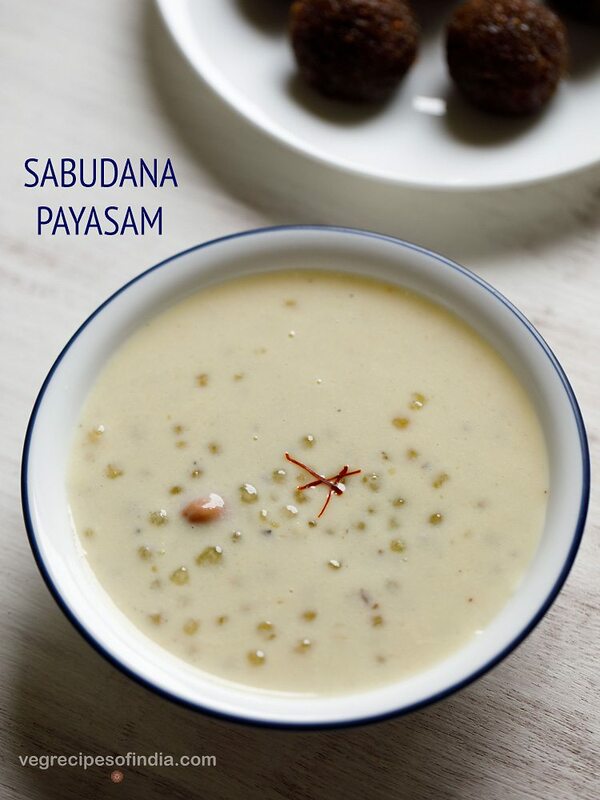 sabudana payasam can be made two ways – one is by soaking sabudana and the other is by roasting sabudana and then cooking it. 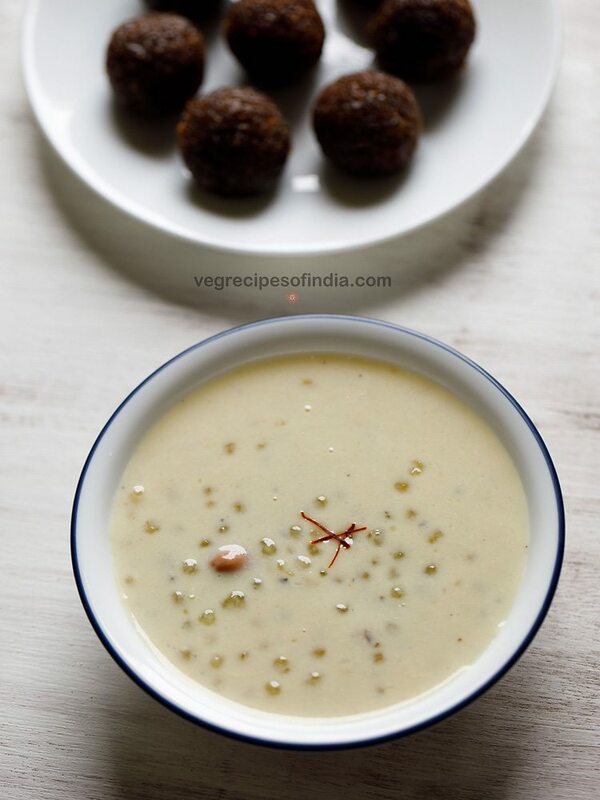 i usually choose the second method which is also how the sago payasam is made in this recipe. since i served javvarisi payasam as naivedyam to lord ganesha, i did add edible camphor, but this can be skipped. 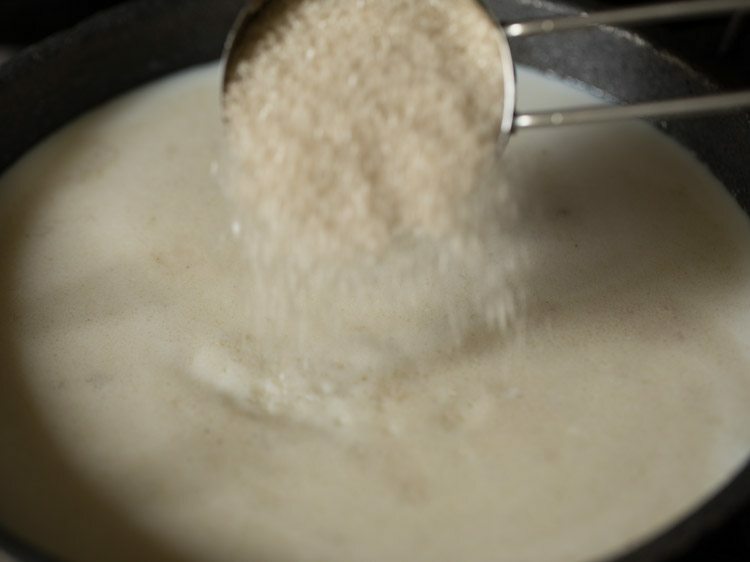 sabudana payasam can be served as a sweet dessert after meals. in a heavy kadai or pan, take 1 tablespoon ghee and heat it on a low to medium flame. when the ghee melts, add 10 to 12 cashews (kaju). 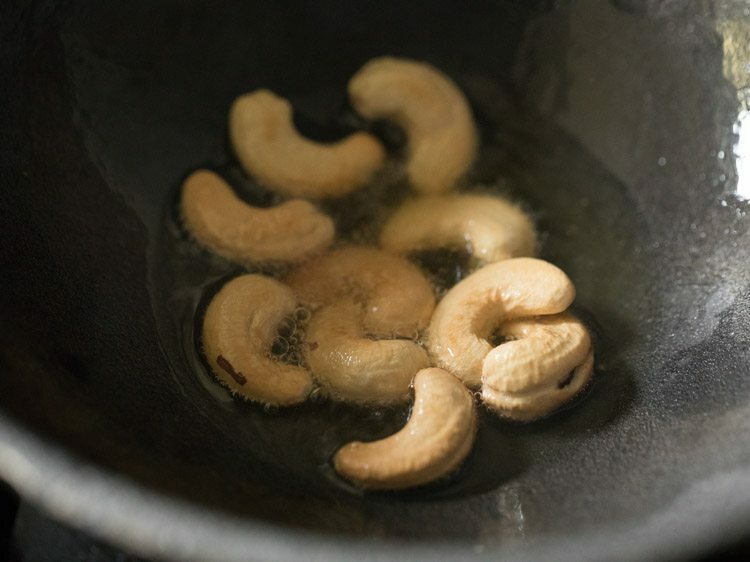 begin to fry the cashews on a low flame. 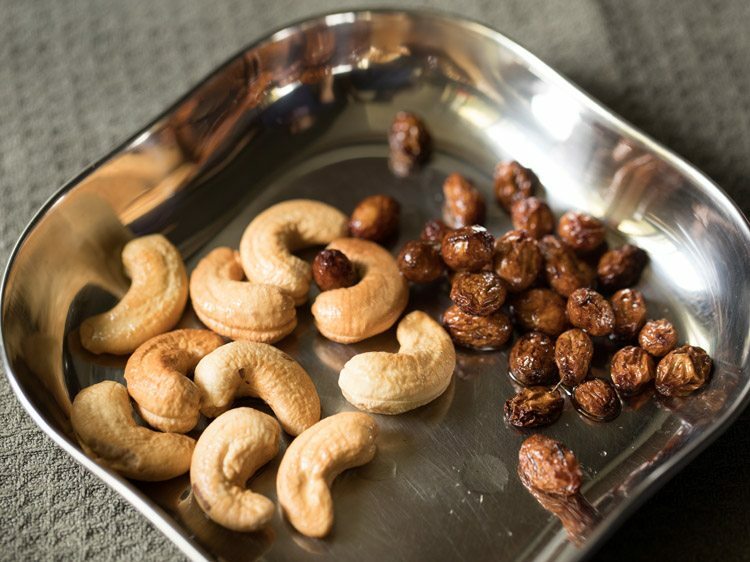 fry cashews till they become golden. remove with a slotted spoon and keep them aside. then add 1 tablespoons raisins (kishmish). stirring often fry the raisins, till they swell and become plump. remove fried raisins with a slotted spoon and keep them aside along with the fried cashews. now add ½ cup sabudana. mix the sabudana well with the ghee and begin to roast on a low flame stirring often. roast for 2 to 3 minutes on low flame. then add 3 cups water. mix well and simmer on low to medium flame. 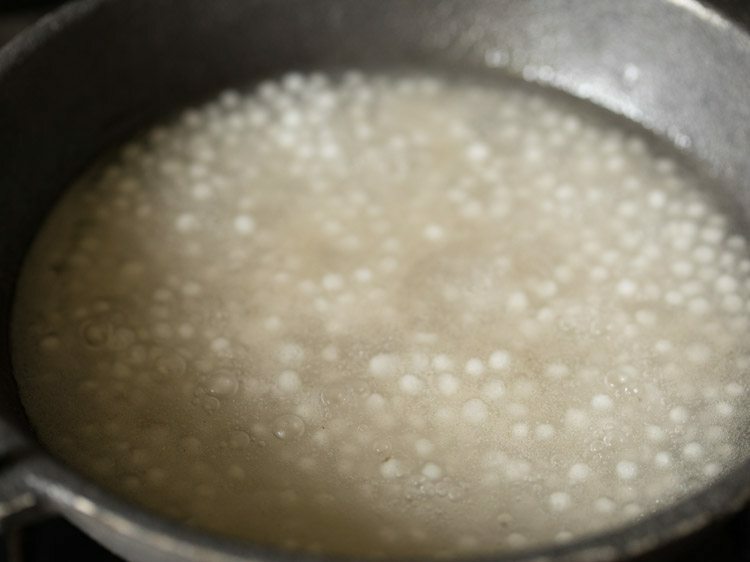 the sabudana pearls will begin to get cooked and start floating on the top. when cooking the pearls, there will be some scum on top. if you want you can remove the scum with a slotted spoon. 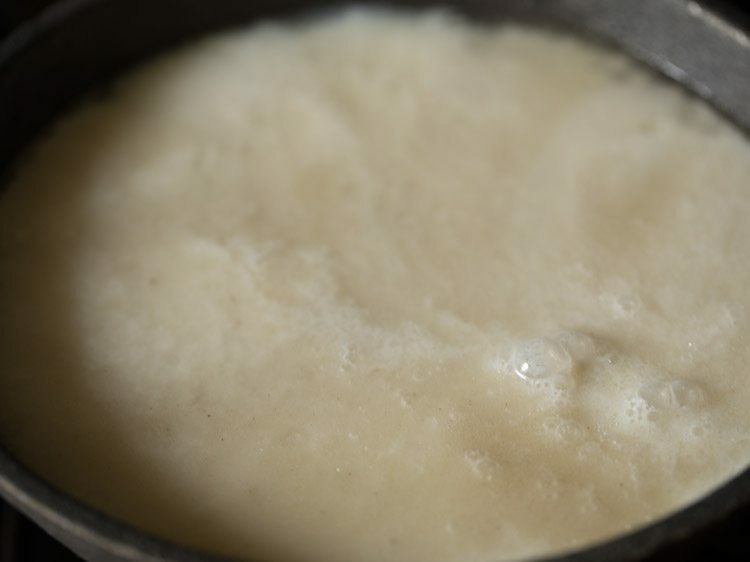 do stir at intervals when the sabudana is cooking, so that the sabudana does not stick at the bottom of the pan. simmer till you see the sabudana pearls becoming translucent and floating on top. then add 2 cups full fat milk. mix well. 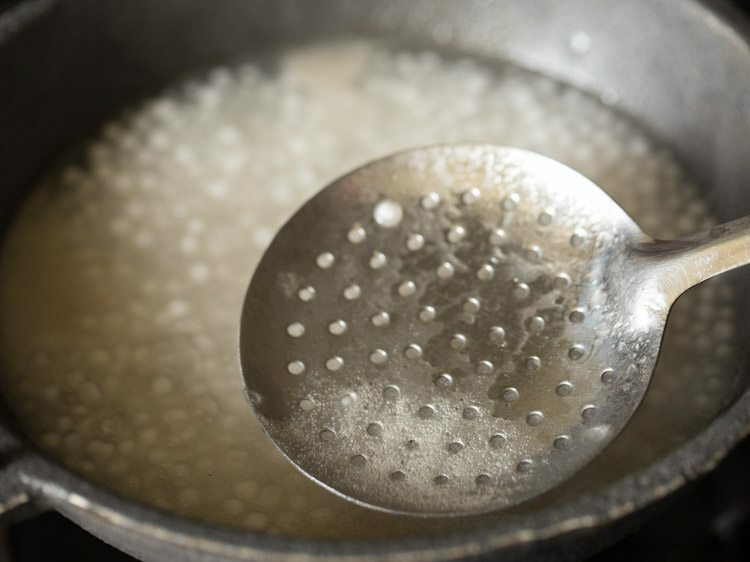 add ½ cup sugar and stir well so that all the sugar dissolves. add ½ teaspoon cardamom powder and 1 pinch saffron. you can skip saffron strands also. 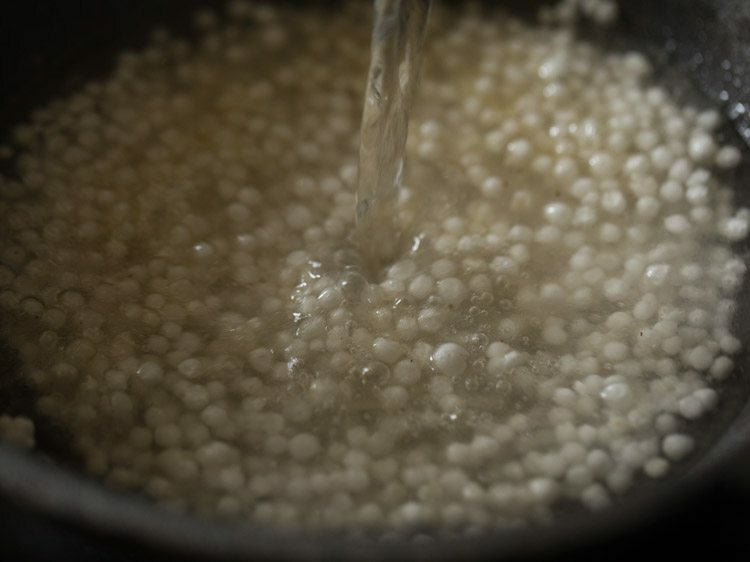 simmer the sabudana payasam on a low flame till the sabudana pearls have cooked well and softened. do stir often so that the sabudana pearls does not get stuck at the bottom. simmer till all the sabudana has cooked well. this takes about 20 to 25 minutes on a low flame. 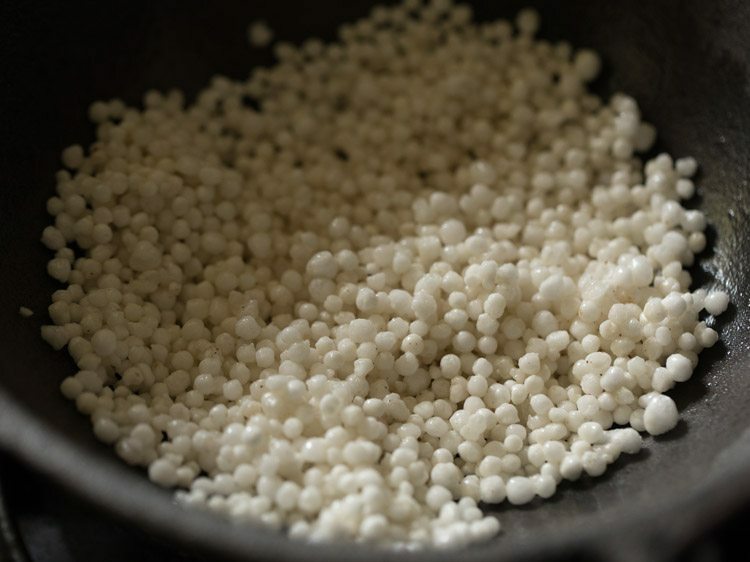 do remember to stir sabudana pearls so that they do not stick and become lumpy. check the pearls and press them between your fingers. they should be completely softened and look translucent. 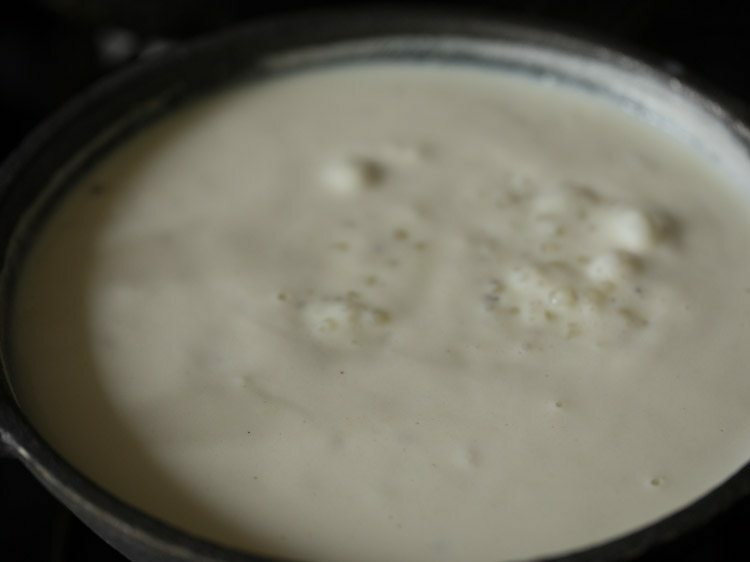 the milk will also thicken by the time the sabudana is cooked. some milk solids will be stuck at the sides. scrape them with a spoon or spatula and add back to the payasam. 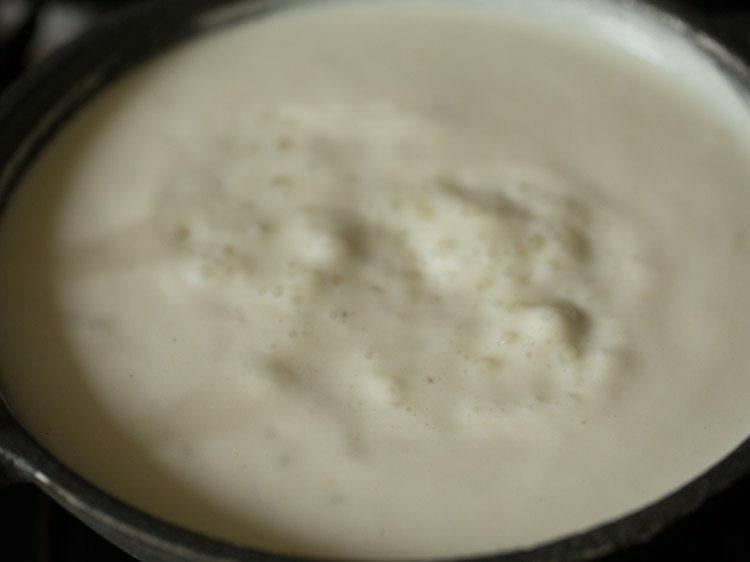 sabudana payasam thickens after cooling. so if you want a thin kheer, then you can add some more hot milk and sugar. lastly add the fried cashews and raisins along with 1 pinch edible camphor. edible camphor is an optional ingredient. mix well. 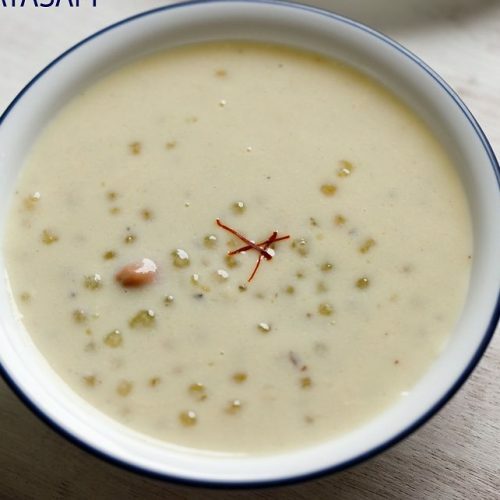 serve javvarisi payasam hot or warm or chilled as a dessert after meals. if offering to your diety, then first offer the sabudana payasam and then serve it to your family as prashad. 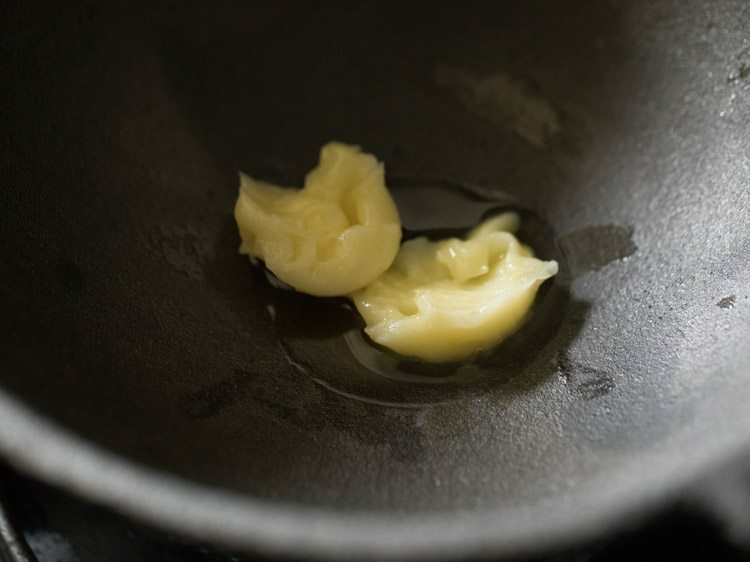 1. in a heavy kadai or pan, take 1 tablespoon ghee and heat it on a low to medium flame. 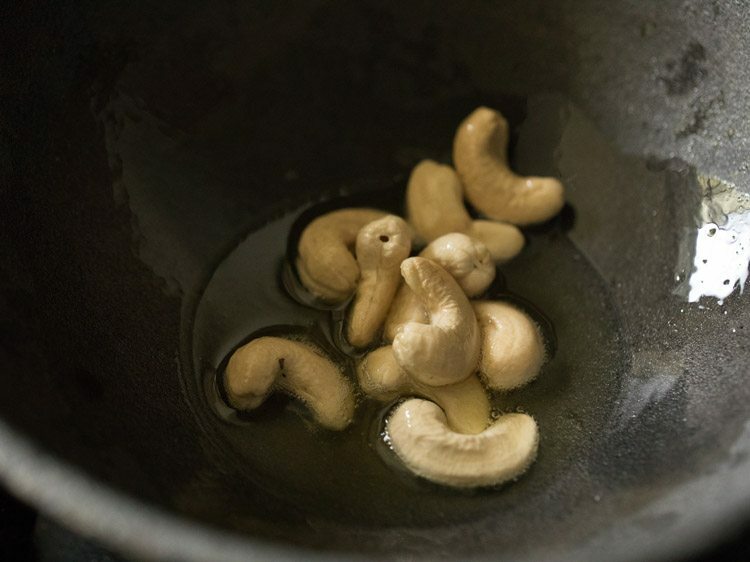 2. when the ghee melts, add 10 to 12 cashews (kaju). 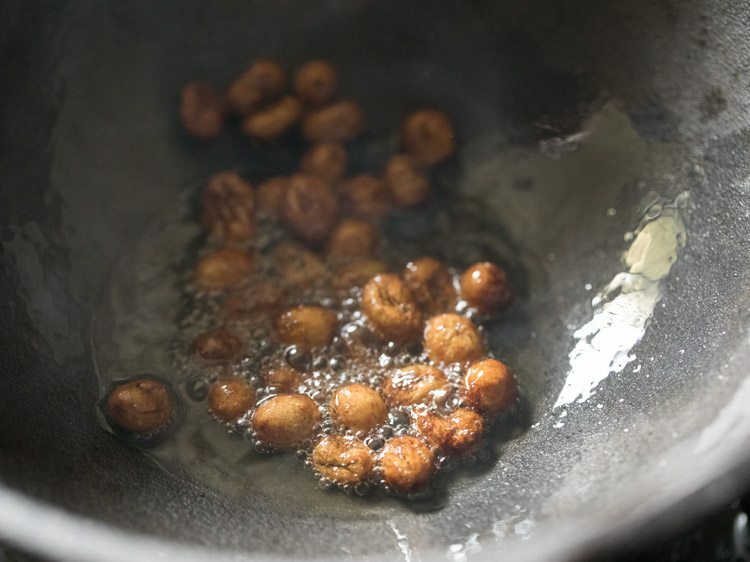 3. begin to fry the cashews on a low flame. 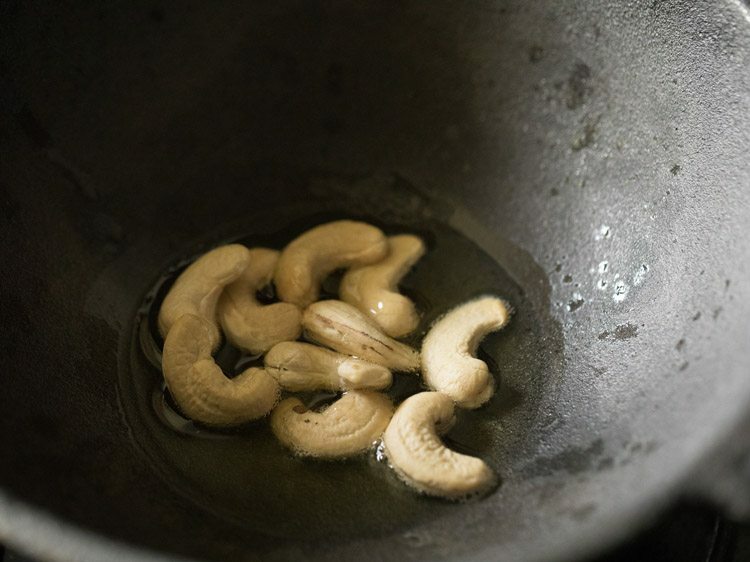 4. fry cashews till they become golden. remove with a slotted spoon and keep them aside. 5. then add 1 tablespoons raisins (kishmish). 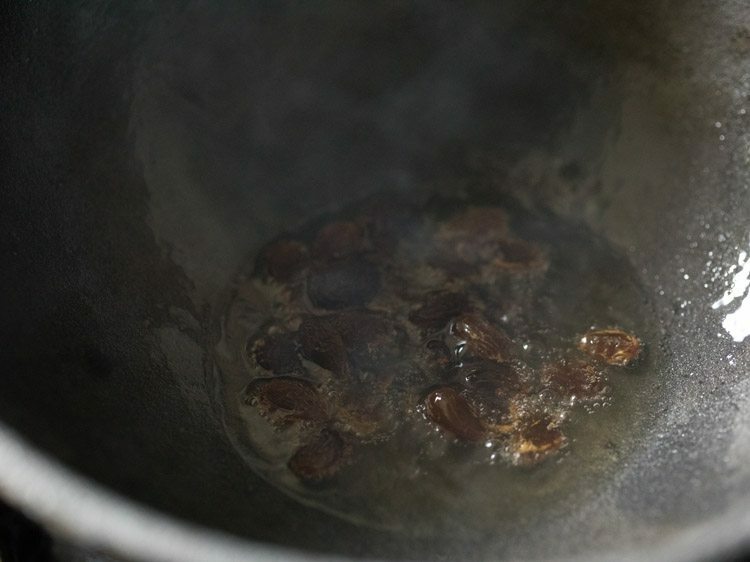 6. stirring often fry the raisins, till they swell and become plump. 7. remove fried raisins with a slotted spoon and keep them aside along with the fried cashews. 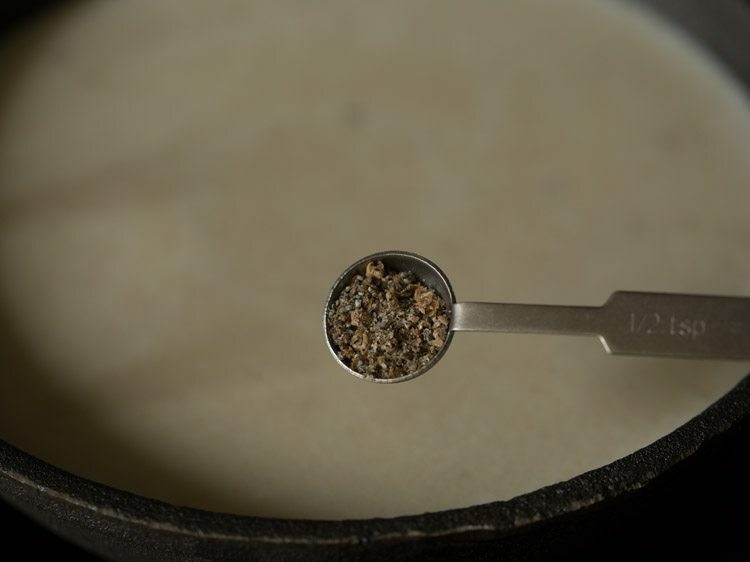 8. add ½ cup sabudana. 9. mix the sabudana well with the ghee and begin to roast on a low flame stirring often. 10. roast for 2 to 3 minutes on low flame. 11. then add 3 cups water. 12. mix well and simmer on low to medium flame. 13. the sabudana pearls will begin to get cooked and start floating on the top. 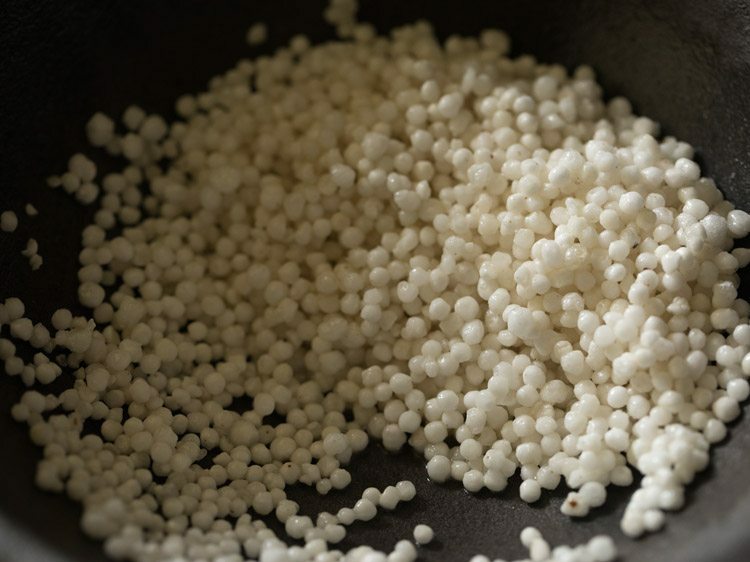 14. when cooking the pearls, there will be some scum on top. if you want you can remove the scum with a slotted spoon. 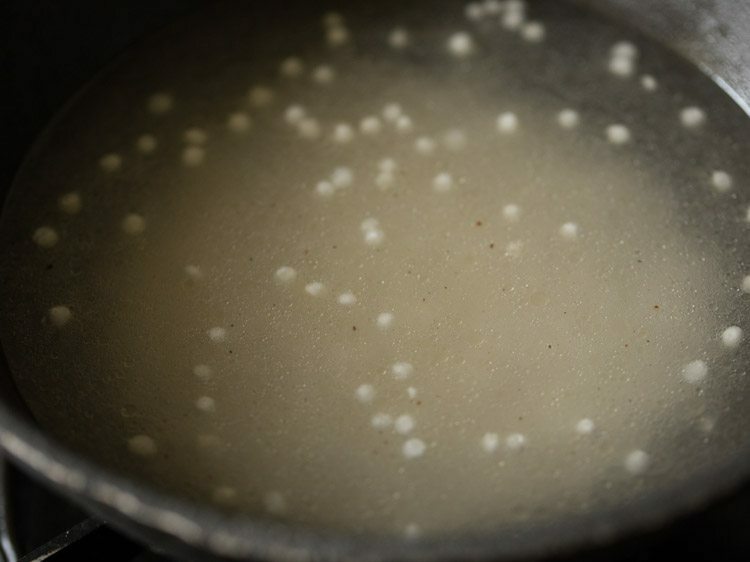 15. do stir at intervals when the sabudana is cooking, so that the sabudana does not stick at the bottom of the pan. 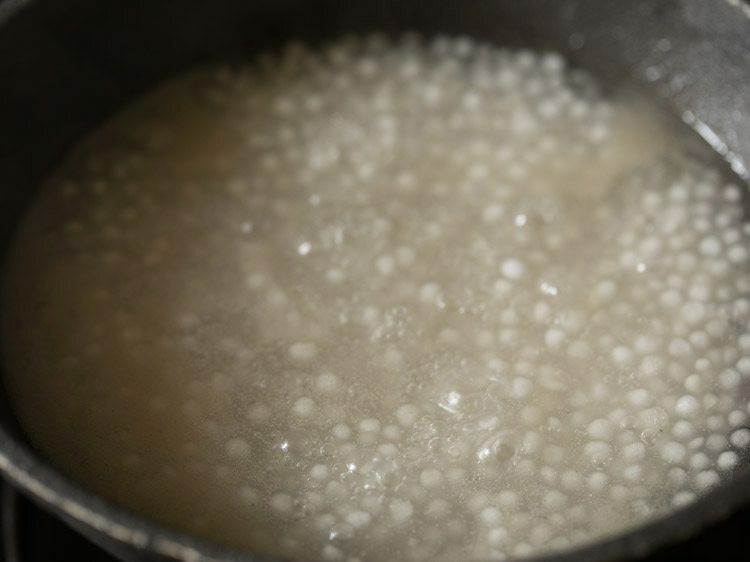 16. simmer till you see the sabudana pearls becoming translucent and floating on top. 17. then add 2 cups full fat milk. 19. add ½ cup sugar. 20. stir well so that all the sugar dissolves. 21. add ½ teaspoon cardamom powder. 22. next add 1 pinch saffron. you can skip saffron strands also. 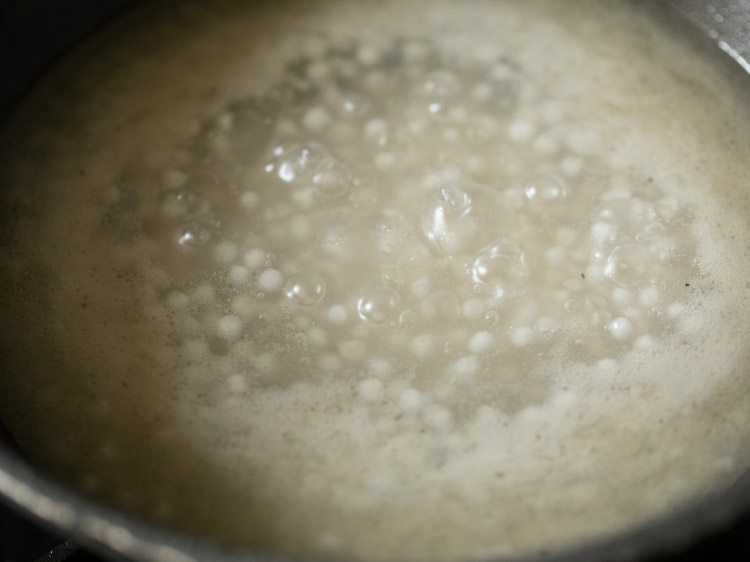 23. simmer the sabudana payasam on a low flame till the sabudana pearls have cooked well and softened. 24. do stir often so that the sabudana pearls does not get stuck at the bottom of the kadai or pan. 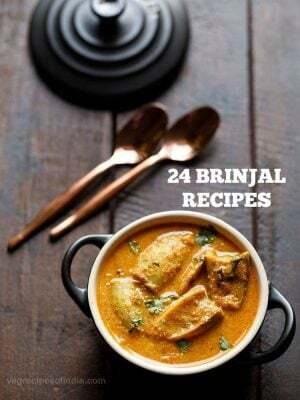 25. simmer till all the sabudana has cooked well. this takes about 20 to 25 minutes on a low flame. 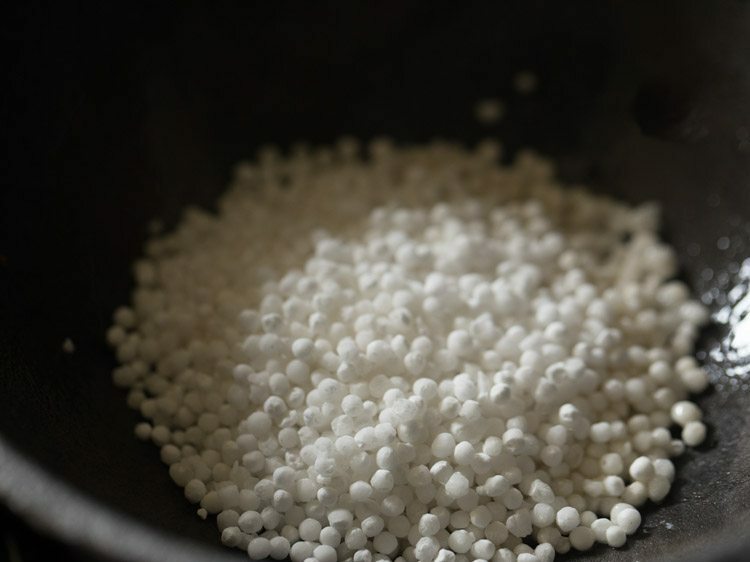 do remember to stir sabudana pearls so that they do not stick and become lumpy. 26. check the pearls and press them between your fingers. they should be completely softened and look translucent. 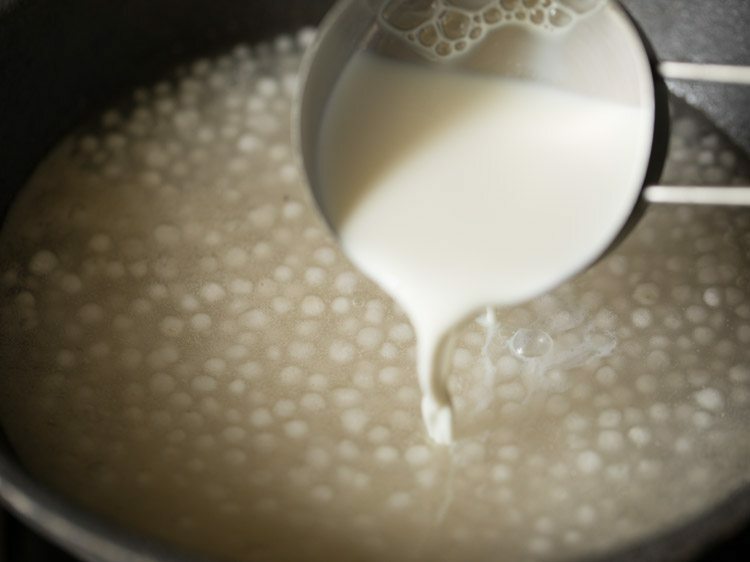 the milk will also thicken by the time the sabudana is cooked. 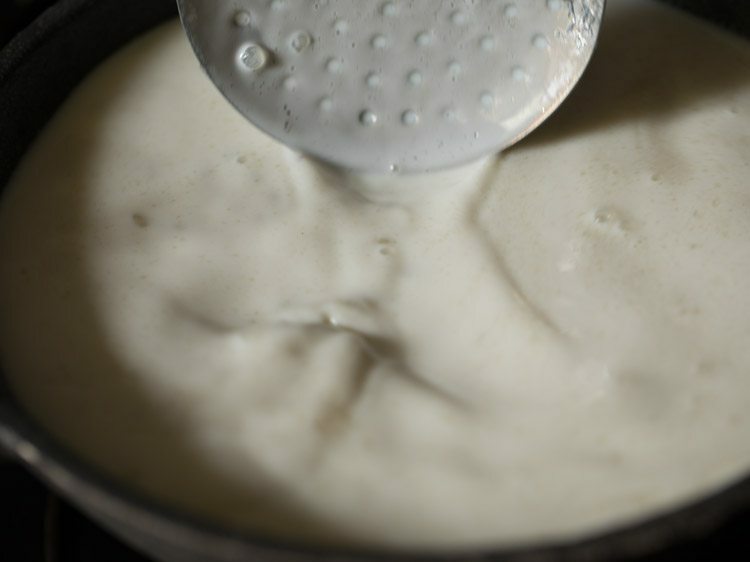 27. some milk solids will be stuck at the sides. 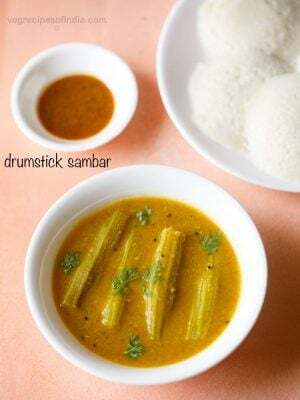 scrape them with a spoon or spatula and add back to the payasam. 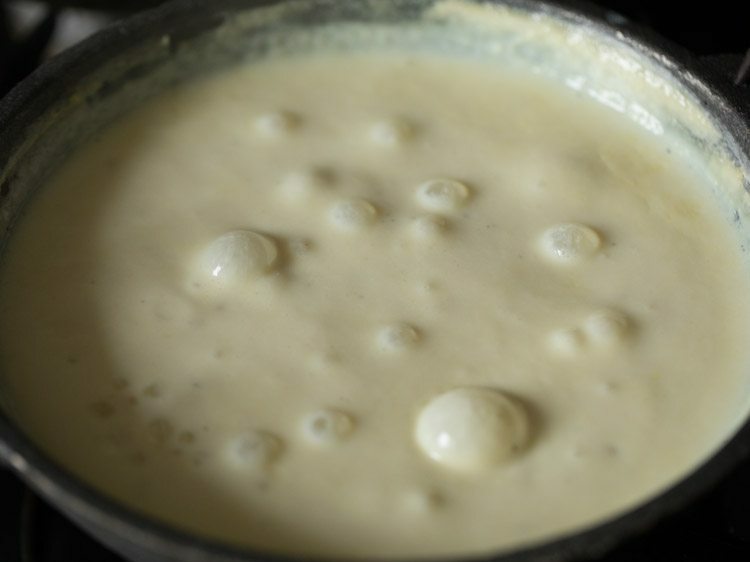 sabudana payasam thickens after cooling. so if you want a thin kheer, then you can add some more hot milk and sugar. 28. lastly add the fried cashews and raisins along with 1 pinch edible camphor. edible camphor is an optional ingredient. mix well. 29. serve javvarisi payasam hot or warm or chilled as a dessert after meals. 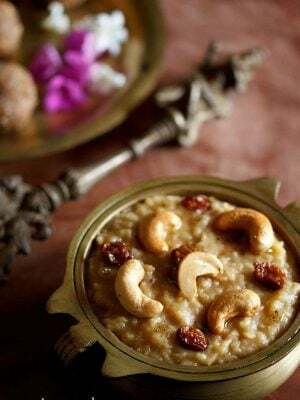 if offering to your diety, then first offer the payasam and then serve it to your family as prashad. thanks shubha. those are ladoos made with fresh coconut, jaggery and cardamom powder. 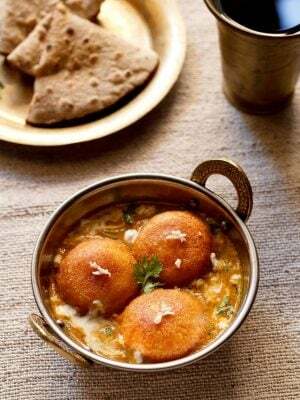 its a bengali recipe of ladoos known as narkel naru. this version is also called as gurer narkel naru.